*PLEASE NOTE: SLEEPING BAGS SHOULD BE LEFT OUT OF LUGGAGE They will be needed for the hotel on Saturday and therefore will be packed in an accessible place. So bring them on Thursday with your big bag but not in your bag. As a reminder, the items in your big bag will not be accessible to you until we reach Trade, TN on Sunday afternoon. All items needed for the ride down, Saturday night and Sunday morning need to be in a small drawstring bag or backpack that you will bring with you on Saturday morning the 7th. Adult leaders will have a final meeting to go over tools to bring, etc. starting at 7:00 p.m.
Any questions, you know how to reach me! See you all on Thursday. Hello Orthodox Youth Mission Team! First, I want to thank all of you—youth and leaders—for a very productive tool and safety training session. We accomplished a lot in one afternoon and I hope you are all feeling more confident about using the tools safely and some of the tasks we will be doing in Appalachia. Always feel comfortable asking questions if you are unsure! No one expects you to become a construction expert in one day! At our next training you will be able to put the skills you learned into practice. We will next meet on Saturday, May 12th at Holy Trinity in Danbury from 9 a.m. to 5 p.m. to actually do some construction projects at the church and rectory. Please remember to wear ASP worksite clothes (long pants, t-shirts and workboots) and to bring sunscreen, hats and water bottles. We will serve lunch ($5 contribution is greatly appreciated). In the meantime, keep those stock sales going—we are no where near our goal as of yet. 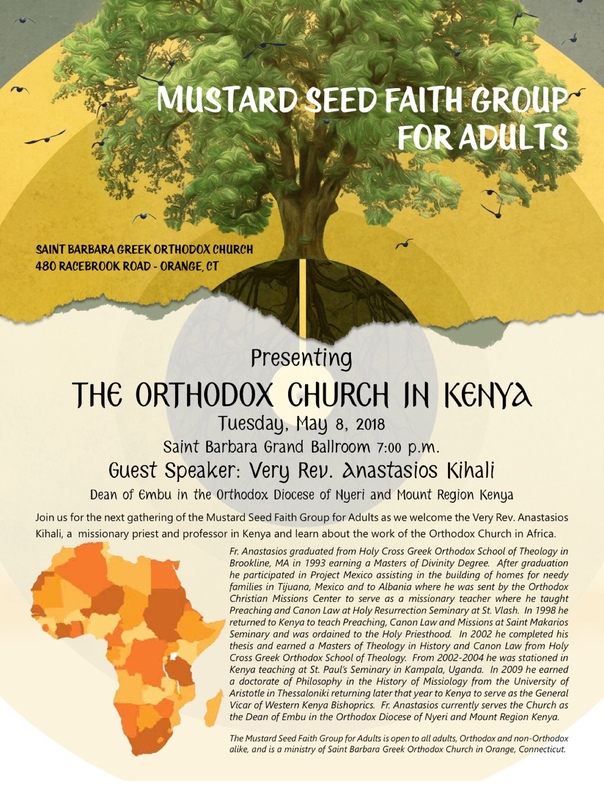 I also wanted to alert you to a presentation that will be of interest to you coming up at one of our team parishes, St. Barbara, in Orange, CT on Tuesday, May 8th at 7:00 p.m.. A priest who has worked with OCMC (the organization that we went to Alaska with on last year’s trip) will be speaking about the Orthodox church in Kenya. I believe in light of all of our discussions about what mission is you will find it very interesting. I have attached the flyer for the event. I am planning to go and hope to see as many of you there as can make it. I hope you all are enjoying a joyous Pascha season with your parishes and your families! Next Saturday, April 21st from 12-5 at Holy Trinity in Danbury, CT we have one of our most important training sessions: Safety and Tool Training. I am happy that everyone is able to make it to this session because it is nearly impossible to make this one up. We will have different stations set up for youth to be instructed on how to safely use various tools and learn basic construction skills that will be needed for our work this summer. We will also be going over ASP safety and stewardship rules as well as other expectations for the trip. Please arrive promptly at noon and eat lunch before you come (we will have a break for snacks mid-way through the afternoon). You will need ASP clothing and gear: long pants, work boots or other sturdy (non-sneaker) closed toe shoes and a t-shirt with sleeves. Bring a water bottle and have on sunscreen. Also bring any stock sale money you have collected so far through your parish coffee hour or personal sales. We will put the skills we use to work doing actual construction work on Construction Day session which will come next on May 12th. Coming down to the end of the training with only 3 sessions to go after this Saturday. And, less than 90 days until our trip! Be sure the remaining training dates are on your calendar as every one will provide vital information about our trip and how to best prepare for our time serving in TN. P.S. We have some exciting news: our teammates from New Jersey/New York City will be joining us for this session. You will have a chance to meet the teens and adult leaders (and welcome back two leaders you already know, Mary Ann and Ernie Delcher) who will be part of our team in TN this summer. Be sure to give them all a warm welcome and veterans help newcomers! Are you ready to put your Faith to work?! As part of an Orthodox Youth Mission Team (OYMT) you will have the opportunity to go on a week-long mission trip this summer to Appalachia, making Christ present by serving people in need and living in community with other Orthodox youth. Who are we? The Orthodox Youth Mission Team is a pan Orthodox group of high school students and adult leaders, led by Fr. Luke Mihaly of Holy Trinity Orthodox Church in Danbury, CT. For the last 7 years we have been participating in youth mission work. We have taken part in the Appalachian Service Project (ASP) and most recently completed a short term OCMC mission trip to Napaskiak, Alaska. When is the trip? July 7-15, 2018 serving with the Appalachian Service Project (www.asphome.org). ASP is “a relational ministry with carpentry on the side.” Crews of teens and adult leaders will work on one family’s home to make it “warmer, safer and drier.” The mission team stays at a school or community center, living together and participating in devotional and team building activities. How do we get there? Typically we rent 15 passenger vans to travel down to Appalachia. On the way we visit an Orthodox parish for liturgy and fellowship. We do the same on the way home and usually end our trip with a night at Hershey Park. Who can join? High school youth who are currently in 8th grade or older (will be 14 by Aug. 1st 2018) and adult leaders (ages 25 and up). We are looking for parishes that would like to form their own crew to participate with us. We will directly with leaders and provide all the necessary training materials and information for your crew. What’s the commitment: Training sessions begin in January 2018. Team members meets about once a month, including 2 full day sessions for safety and tool training and a construction work day. Team members are expected to attend all meetings and to help with the fundraising for the trip. How much will it cost me? $300 per teen. Adult leaders give their time and are not asked to pay. Scholarships are available—OYMT will not turn away any teen who cannot afford the fee. How do I find out more? Contact Fr. Luke Mihaly at Padreluke@aol.com or team coordinator, Susan Sulich at ssulich@yahoo.com for more information. You can also visit our website www.oymt.info and our Facebook page: @OYMT1. We look forward to hearing from you and sharing this youth mission opportunity! We want to say a great BIG thank you to all of you for helping fund our Mission Trip this past summer to Napaskiak, AK. Your financial contributions, prayers and other support paid off in a wonderful trip that blessed us the servers as much as those that we served, as you will see by the reflections of the youth in our newsletter. If you are unable to attend a session in person, please take a look at our photo gallery or our web site. Plans are underway for a July 2018 trip with ASP!! If you know of anyone who may be interested in joining us, please have them call 203-746-6008 or email ssulich@yahoo.com by November 12. It was a blessed trip for all of us. I&apos;m sure all of you noticed a difference in culture from Napaskiak to what you found back here in &apos;the lower 48.&apos; I noticed the difference in culture just from the airports on the way home. We contacted Presbytera Renee and went over some of the points OCMC give to their missionaries when they return home from a mission trip. These are the ones we want to share with you. Please read them carefully; think and pray on them. · Be open to what God taught you while you were in Alaska. · Keep up your prayer life. · Allow yourself to reflect a changed live. · Think about the most important things you want to share with others to inspire them about your Team experience. · Don’t expect others to be as excited about your experience as you are. · Be careful about value judgments – don’t judge people back at home or Alaska. · Sometimes injustices or poverty lead us to ask ‘why’ (why not me; why here; why so much; why so little). Get involved in your own Churches outreach and make a difference around you. Pray for Orthodox Missions. Pray for your parish at home. Pray for those you met in Napaskiak. · Be prepared for nostalgia – most people miss being with teammates, the hosts and having something meaningful to do. · Don’t let a little depression take you by surprise – we can become sad and miss the love and joy we were surrounded with. · Keep in touch! – with your team members, hosts, OCMC. · Contact your supporters – and share how meaningful your experience was and how you appreciated their financial and prayer support. Remember to pray for each other and those in Alaska we came to know so well. If you have any questions please feel free to contact me. LAST two meetings, pay attention!! There will also be a presentation from Matushka Tamara Cowan from Holy Trinity Yonkers who has spent much time in Alaska and will share first hand some “insider info” and maybe teach us a phrase or two in Yup’ik. There will be no meal on Saturday. Please bring any additional stock sales/fundraising proceeds. Looking forward to seeing all of you and completing our training for our mission trip together! Sleepover Retreat this Weekend! Parent meeting on Sunday! · Arrive at Holy Trinity on Saturday, April 29th at 8:30 a.m. for breakfast. · We will also provide lunch, dinner, and breakfast after liturgy on Sunday. · What to pack: ASP dress code appropriate attire for day sessions (no work boots required) and sleeping, a Bible, clothes for liturgy on Sunday. Bring an air mattress or mat and sleeping bag. (NOTE: on our trip we will not be bringing air mattresses, only camping mats. This may be a good time to purchase and try out your mat to make sure it works for you.) If the weather cooperates, boys/men may be sleeping outside—we will provide the tents. · There will be separate bathrooms for males and females; no showers. · We will be making breakfast on Sunday as a fundraiser for our trip. PARENTS: There will be a question and answer session for parents with Andy from 1:00-2:00 p.m. on Sunday. A parent for each teen is strongly encouraged to attend. This will be your one opportunity to speak directly with someone from OCMC about our trip and get any and all questions you have answered. Hope your fundraising efforts are going well. Please bring all stock sales and fundraiser proceeds you have to our training session. We have passed the half way point of $10,000 toward our stock goal. We will need to make a photocopy of your id in order to submit names for your airline tickets. Please bring your id with you on Saturday so we can photocopy. If you do not have one of these forms of ID please make arrangements to get one before our May meeting. That will be the deadline for copying ID’s. If anyone has any questions, don’t hesitate to contact me by phone or email. Looking forward to seeing everyone on the 29th! Hope everyone is enjoying a good start to their Lenten journey. It’s time to focus on our stock sales—our biggest fundraiser for our mission trip to Alaska. At this point all letters have been mailed (for the few of you who were not at the meeting you should have received your materials in the mail and if you haven’t already, please mail out on Monday). Now to our parish sales: I have sent an email to all of your parish priests. Please remember to coordinate with your priest as you plan your coffee hour stock sales. It is essential that everyone participate in this fundraiser. Beth included sheets in the stock kit for sign-ups for each of the Sundays during lent. Every youth and adult leader should take a turn or work as a group. Hitting our goal of $20,000 is necessary to make it possible to fund our trip. Our next mandatory training session will be Sunday March 12th from 3:00-5:00 p.m. at St. Barbara (480 Racebrook Rd, Orange, CT 06477). We will be doing some specific training for our work in Alaska and will also go over the schedule and details for the weekend training session on April 29-30. Please bring any stock sales that you have received, $5 for dinner and, if you have not already paid it, the final $150 volunteer fee. Looking forward to seeing everyone at St. Barbara.